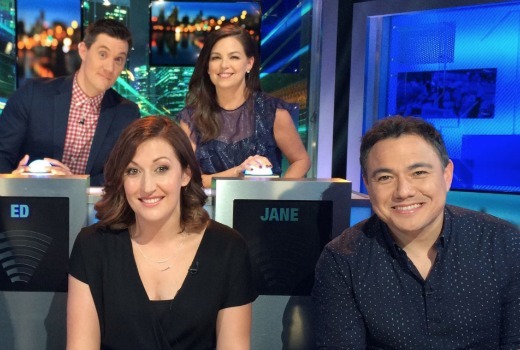 Tonight Sam Pang, Ed Kavalee, Urzila Carlson, Celia Pacquola, Marty Sheargold join host Tom Gleisner for a Have You Been Paying Attention? 2016 Year In Review special. Making hilarity from the headlines, we go back through all the big moments from 2016 and see just how much our celebrities can remember from the past 12 months – from Eurovision to elections, Brexit to Bathurst, the Rio Olympics to the Melbourne Cup, plus all the celebrities hook ups, break ups and public spats. It is the chance to test our contestants on all things celebrity, politics, sport, current affairs, pop culture and international events from the year that was. Joining in our end of year party are some of 2016s biggest news makers – including Bindi Irwin, Olympic gold medal swimmer Mack Horton and The Living Room and I’m A Celebrity… Get Me Out Of Here! co-host Dr. Chris Brown – who join Tom at the podium as guest quiz masters. How much of 2016 can you remember? Test yourself against our seasoned professionals on the Have You Been Paying Attention to 2016? Year In Review Special. Monday, 21 November at 8.30pm on TEN.